Nothing can ruin a morning shower like low water pressure. If it’s time to say goodbye to your aging shower head or there’s a new one with different features you want to try, consider replacing the shower head yourself. Make sure the water is turned off before removing the shower head. 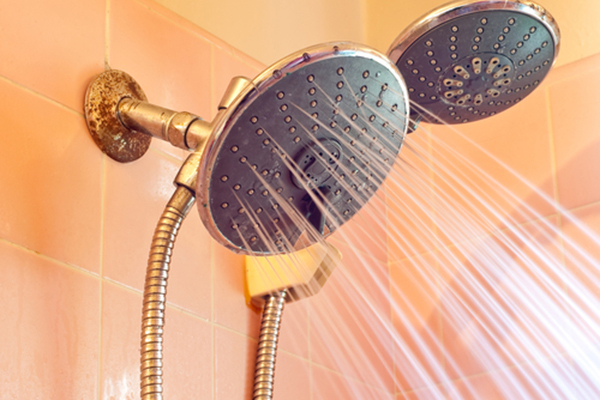 A weak stream may still have enough force to make the shower head pop off unexpectedly. If this happens while you are detaching the shower head from the pipe, it can cause injury. Loosen the shower head using your hand. Twist it left or counter-clockwise. If you are unable to loosen it by hand, use a wrench. First, wrap a cloth around the shower head to protect the finish and ease removal. Then use the wrench to grab and unscrew the shower head. After removing the old shower head, check the shower neck or fitting. Threads on the pipe may be coated with rust deposits, old Teflon tape, or other gunk. Just clean with a damp cloth or paper towel. A small brush can also be helpful. Apply fresh Teflon tape to the threading. This will ensure a tight fit for your new shower head. Next, the tape clockwise around the threads, starting at the base and moving to the end of the fitting. Then press the tape into the threads with your thumbs. Attach the new shower head by screwing it on clockwise or to the right. Use your hands to tighten the shower head as much as you can, then use the wrench (with a cloth) to secure it. Once the new shower head is in place, turn the water on to check for leaks. If you notice any, turn the water off and use the wrench to tighten the shower head further. Repeat this step until there are no leaks. Following this process, you can install a new shower head in just a few minutes. It’s so easy that after you do it once, you may decide to replace all of the old shower heads in your home with new ones you can enjoy. If you want to avoid this in the future, a home warranty covers shower heads and can help you avoid costly and tedious DIY repairs.